I believe I wore white every day of vacation this past week. It just works with everything. Monday after a week of fun is always a little rough. My head is....foggy. So happy Gabe still has some time off. We still have a summer list to conquer. Hope each of you had a grand weekend! Wow, mint is a gorgeous color on you!! I love how simple and classic this look is. So pretty! I love how breezy and cool the whole outfit looks on you! Beautiful! so simple yet so chic! Mint is my favorite shade for this season and I love how you paired it with white pants. Gorgeous! You look stunning in white! Love. That color looks perfect on you! Glad you had a great time with your family! You've just stumbled on probably my most favorite outfit... white + turquoise... I'm in love. Love, love , love the mint! It goes perfectly with the white pants :) Glad you two still have some time left to savor summer... good luck with your list! Gorgeous outfit- that minty blue is lovely on you! Love that top! The color looks fantastic on you. This combination is so crisp and clean and summery! I finally got some mint in my closet, so I can't wait to try it out with white as well. But it looks lovely on you! I love this mint trend. This shirt is so pretty! Love this outfit - it's so easy and cool for a hot summer day. I love mint! it's one of my favorites. You look gorgeous as always! I need that top! It's so beautiful on you!! Anna!!! ugh! one of my FAVORITE OUTFITS. give it to me. So glad y'all have some time off. I agree that Monday's after a vacay are tough. Love your look sweet Momma! Enjoy the rest of your family time! Minty green has always been one of my favorite colors - so fresh! Beautiful!! I'm all gaga over your top. Seriously. Mint is so cool and refreshing. I love how that blouse just FLOWS. Gorgeous look Anna! Love the color and style of that blouse, gorgeous! The color of the top is great on you, and I'm a sucker for white jeans! Love this! I am terrified of wearing white pants! I know they are basically essentially have during the summer but I am so afraid of getting them dirty! 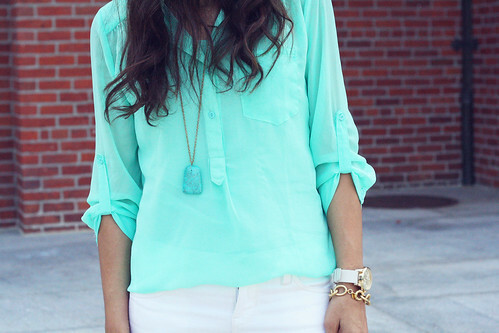 That's the most perfect mint colored chiffon blouse. I definitely need more chiffon in my life! WOAH . Mint is definitely your color ! I love the bright white and bright top ! You are gorgeous , lady ! Girl I am buying that top STAT! Love the color and GREAT price! Such a cute look! 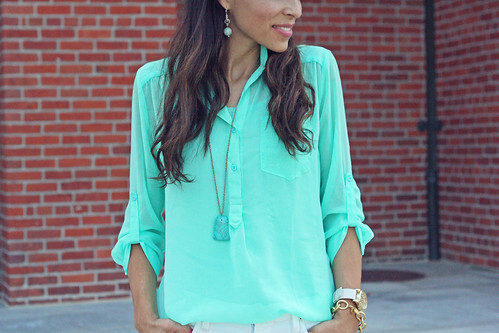 Loving that minty top and your turquoise ring!! This outfit is perfect...I cannot stress how simple yet chic it is! And mint really is one of your colors, you should wear it often Anna! That color is absolutely STUNNING on you Anna! Love that quote from Audrey! the last picture is so special... loving the summer brights.